BOSTON (AP) — Attorneys for the late Aaron Hernandez are asking Massachusetts' highest court to reverse its decision to reinstate the former New England Patriot's murder conviction. BOSTON (AP) — The late New England Patriots player Aaron Hernandez expected to be released from jail and resume his football career shortly after his arrest on a murder charge, according to newly released jailhouse telephone calls. Hernandez, convicted of one killing and acquitted of two others, took his own life in prison in April 2017. PROVIDENCE, R.I. (AP) — The former fiancée of the late NFL player Aaron Hernandez says she is expecting a baby. Shayanna Jenkins Hernandez made the announcement in a post on Instagram on Tuesday. She says she and her daughter with Hernandez, Avielle, are "blessed" to be expecting a baby girl. She did not say who the father is or when she is due, and asked for privacy. BOSTON (AP) — Massachusetts' high court will consider whether the state should get rid of a centuries-old legal principle that erased Aaron Hernandez's murder conviction after the former New England Patriots tight end killed himself. The Supreme Judicial Court recently announced that it will hear the former NFL star's case and examine the legal principle under which courts typically dismiss the convictions of defendants who die before their direct appeals can be heard. TAUNTON, Mass. (AP) — Aaron Hernandez's fiancee has sued the estates of three men the former New England Patriots player was charged with killing in an effort to ensure their daughter benefits from the sale of the ex-NFL star's home. BOSTON (AP) — A longtime Boston prosecutor who handled cases involving former New England Patriots player Aaron Hernandez and a murdered girl who washed ashore in a trash bag and came to be known as Baby Doe says he's not running for re-election. Suffolk County District Attorney Daniel Conley said Tuesday he won't be seeking another four-year term in November. BOSTON (AP) — Suffolk County District Attorney Daniel Conley, who handled high-profile cases including those involving Baby Doe and former New England Patriots tight end Aaron Hernandez, said on Tuesday he won't be seeking another four-year term in November. Boston's longtime prosecutor said in a public statement and an email to staff that it's time to clear a path for someone else to take the lead running the office. NORTH ATTLEBOROUGH, Mass. (AP) — The more than $115,000 in back taxes owed on the Massachusetts home that once belonged to former New England Patriots player Aaron Hernandez have been paid. NEW YORK (AP) — The defense attorney for the late Aaron Hernandez is writing a book about the former NFL star and promises "shocking revelations." BOSTON (AP) — Eight months after ex-NFL star Aaron Hernandez hanged himself in prison, a new book by bestselling author James Patterson is reviving unanswered questions. Patterson spoke with The Associated Press on Friday about what he calls "the most fascinating, complicated and troubling crime story of our times." BOSTON (AP) — Former New England Patriots tight end Aaron Hernandez's life and death will be the subject of a one-hour special episode of "48 Hours" to be broadcast on Jan. 20. BOSTON (AP) — Lawyers for the estate of late NFL star Aaron Hernandez are trying to prevent a $20 million lawsuit against the National Football League from being merged with a wider class-action suit addressing former NFL players' head injuries. NORTH ATTLEBOROUGH, Mass. (AP) — Aaron Hernandez's home has been sold for $1 million, about $300,000 lower than the asking price. The Boston Herald reports that the 7,100-square-foot mansion in North Attleborough was sold to 23-year-old real estate investor Arif Khan. From revelations that Aaron Hernandez had catastrophic brain damage to Richard Sherman becoming the latest star to go down with a season-ending injury to a groggy Russell Wilson somehow getting back on the field in barely the amount of time it would take to ask him his name, it's been a brutal 24 hours for the NFL. Certainly, it's not a good time to be a football player. Then again, we're learning it's really never a good time to be a football player. 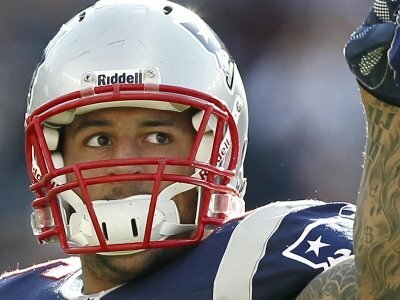 BOSTON (AP) — Former New England Patriots player Aaron Hernandez suffered substantial damage to parts of the brain that affect memory, judgment and behavior from the most severe case of a degenerative disease linked to head blows ever found in someone so young, a researcher said Thursday. BOSTON (AP) — A lawsuit brought over hacked jailhouse phone calls of former NFL star Aaron Hernandez has been dismissed by a Massachusetts judge. BOSTON (AP) — A justice on Massachusetts' highest court has denied prosecutors' request to reinstate the murder conviction of former New England Patriots player Aaron Hernandez. The conviction in the 2013 fatal shooting of Odin Lloyd was voided by a Superior Court judge in May because Hernandez killed himself in prison. Under Massachusetts legal principle, courts typically erase the convictions of defendants who die before their direct appeals can be heard. Attorneys for the daughter of former New England Patriot Aaron Hernandez have refiled their blockbuster brain-injury lawsuit in state court — and are going after a company that has manufactured football helmets for decades. The suit, which was filed yesterday in Norfolk Superior Court, claims the National Football League, helmet manufacturer Riddell Inc. and others systematically hid evidence that football could cause serious brain injuries. DEDHAM, Mass. (AP) — Football helmet maker Riddell says it intends to vigorously defend its products and its reputation against concussion-related lawsuits like one lawyers for late New England Patriots tight end Aaron Hernandez have filed in Massachusetts against it and the NFL. Des Plaines (dehz playnz), Illinois-based Riddell says it introduced helmets designed to mitigate concussion risks more than 15 years ago. BOSTON (AP) — Lawyers for former New England Patriots tight end Aaron Hernandez say they are moving their lawsuit against the NFL from federal to state court because they can make more claims there. The attorneys sued the league last month after Hernandez was diagnosed with chronic traumatic encephalopathy. They accused the NFL of hiding the true dangers of football. They sought damages on behalf of Hernandez's 4-year-old daughter for the loss of her father's companionship. CHICAGO (AP) — One of the nation's largest football equipment manufacturers is testing new helmet designs, as the Illinois company and its competitors try to create a safer helmet. FOXBORO -- When researchers at Boston University announced Tuesday that they may have found a way to detect chronic traumatic encephalopathy, a brain trauma commonly referred to as CTE, in living patients, it represented much-needed hope in a critical health issue facing professional football players. At the moment, CTE can only be diagnosed by performing tests on the deceased. Aaron Hernandez was $2 million in debt when he hanged himself April 19 in his cell at the Souza-Baranowski Correctional Center in Shirley, according to new court filings — the lion’s share owed to the celebrity lawyers who days earlier had cleared his name of a double homicide. Can brain disease explain Aaron Hernandez’s behavior? CHICAGO (AP) — Former football star Aaron Hernandez' brain was riddled with damage from a degenerative brain disease linked with head blows, but that doesn't necessarily explain the troubles that plagued his young life. Lawyers for Aaron Hernandez's daughter are suing the NFL and the New England Patriots over his death. WORCESTER, Mass. (AP) — Four former inmates at a maximum-security prison in Massachusetts have pleaded not guilty to charges in connection with a riot that destroyed a housing unit. Telegram & Gazette reports (http://bit.ly/2vZd4No ) the men, now held at another prison, were arraigned Wednesday on charges that include vandalism and disturbing a correctional institution. Fifteen inmates face charges. DAVIE, Fla. (AP) — Miami Dolphins center Mike Pouncey says Aaron Hernandez was in great spirits when they talked on the phone the day before the former New England Patriots tight end hanged himself in his cell in a maximum-security prison in Massachusetts. NEW BEDFORD, Mass. (AP) — Aaron Hernandez's home is back on the market after an agreement to sell it for $1.3 million fell through, a lawyer for the former NFL star's fiancee told a judge on Monday. Aaron Hernandez’s estate may be close to broke, and attorneys representing the families of two men the former tight end was accused of murdering are calling on the New England Patriots to compensate them for their loss. BOSTON (AP) — Two families that filed a wrongful-death lawsuit against the estate of former New England Patriots star Aaron Hernandez have asked the team to compensate them for the loss of their loved ones. Hernandez was accused in the 2012 fatal shootings of Daniel de Abreu (ah-BRAY'-oo) and Safiro Furtado but was acquitted in April. Days later he hanged himself in prison, where he was serving a life sentence in the 2013 killing of Odin (OH'-dihn) Lloyd. BOSTON (AP) — Massachusetts prosecutors on Friday appealed a court ruling that erased former NFL star Aaron Hernandez's murder conviction in the 2013 killing of a semi-professional football player. BOSTON (AP) — The legal tradition in Massachusetts of erasing criminal convictions when a defendant dies before an appeal can be heard is coming under renewed scrutiny following the prison death of Aaron Hernandez. BOSTON (AP) — The dismissal of Aaron Hernandez's murder conviction after the former NFL star took his life in prison has renewed calls to change a longstanding legal tradition in Massachusetts.